I met him once. Rev. Billy Graham. He thanked us kindly, and down he went. But my friend and I? We were left staring. We joked about running after him. To shake his hand. To ask him about his life. I guess if it were today, we’d have begged him for a selfie. But we didn’t do any of it because we figured we’d look too much like groupies. I kind of wish we’d done it anyway. Now, at 99 years of age, Franklin “Billy” Graham has passed away. Can you imagine the party in heaven as they welcomed him home? How many people will he meet who are there because of his preaching, either directly or indirectly? From our 30-second exchange, I would agree with both. He stood tall but was clearly humble. He was known the world over, but he acted simply. He was stately, but without an ounce of pompousness. I know, it seems silly to assess someone in less than a minute, but somehow with him it was possible. He was authentic. I can still see his gentle smile. And yet, perhaps it wasn’t just thirty seconds. It was a lifetime of feeling like I knew him. On the six degrees of Kevin Bacon, I had Billy Graham in two. His son-in-law was my dentist. No, the famous evangelist never walked in on a tooth cleaning. But you tend to look closer at people when there’s a connection. But even in my childish wants, I recognized Graham’s firm passion. His boldness. The way he said “Jesus”—with all the authority that comes with the name, and yet all the tender love of one who has met Him. And then there was the altar call. The stream of people pouring down to ask for Christ’s salvation. The song “Just As I Am” pulling them out of their seats. And every time, no matter how many evenings we had watched the crusade, no matter how frustrated I was at the long hour, that moment choked me up. And I found myself praying that more would stand up and walk down. As I grew, I realized Dr. Graham was telling a story. With his distinctive delivery, he laid out the story of the cross. Of Christ’s death and resurrection. Of His sacrifice for each and every person “within the sound of [his] voice.” And beyond. Then he told the story of those people—the ones listening in those stadium seats. On their couches. In their cars. No, he didn’t know each one individually, but he knew them collectively. Because he knew his own heart. I can still hear him saying it. His voice echoing across the air. He spoke to millions. And yet he never bragged of it. He didn’t use his platform for political clout. Didn’t raise zillions of dollars for his own mansion. Not all of us are television evangelists. Not all of us are called to stand on a platform and speak to millions. But we are all called to boast only in the Gospel. And to live out that good news for our neighbors. I don’t know what Dr. Graham would have done if my friend and I had run after him that day. If we’d had the technology, would he have laughed and joined in the selfie? Maybe. I don’t know him well enough to say. But I think, from the times I spent watching him preach, from the few seconds that I met him, from the testimonies of those who knew him best, he would say it doesn’t really matter if I knew him. Or if I know someone else who knew him. What matters is if I know his Lord. And if I share Him with others. Because, as Graham’s messages repeated, we don’t know the day or the moment when it will be too late to make a decision. We don’t know what the next hour will hold. Could there have been a truer statement for the world we find ourselves in today? This week? This month? This world is not eternal. But the next one is. Who we know now affects where we’ll be there. And, no, that doesn’t mean “30 seconds with Billy.” Do those around us know Who it is? But he had an answer to that. His paraphrase of D.L. Moody. I’m sure you’ve heard it a thousand times in the past few days, but it bears repeating. Straight to the loving arms of Jesus. I wish I HAD followed Dr. Graham that day. To shake his hand and thank him. For his testimony. For his example. But one day, I’ll have another chance to do that at that new address. And I pray that when I get there, I’ll find that my own life has produced fruit. That, like Graham, I’ll meet people who are there because of my testimony, either directly or indirectly. Not because I’m some extraordinary person. But because Jesus is. Praise God, I have met HIM. And I know Him well! This entry was posted in scattered kernels and tagged Billy Graham, boast in the Lord, I am a sinner I need a Savior, Just as I am. I remember watching the Billy Graham Crusades while growing up in the 1960s, accompanied by the music of Cliff Barrows and George Beverly Shea. 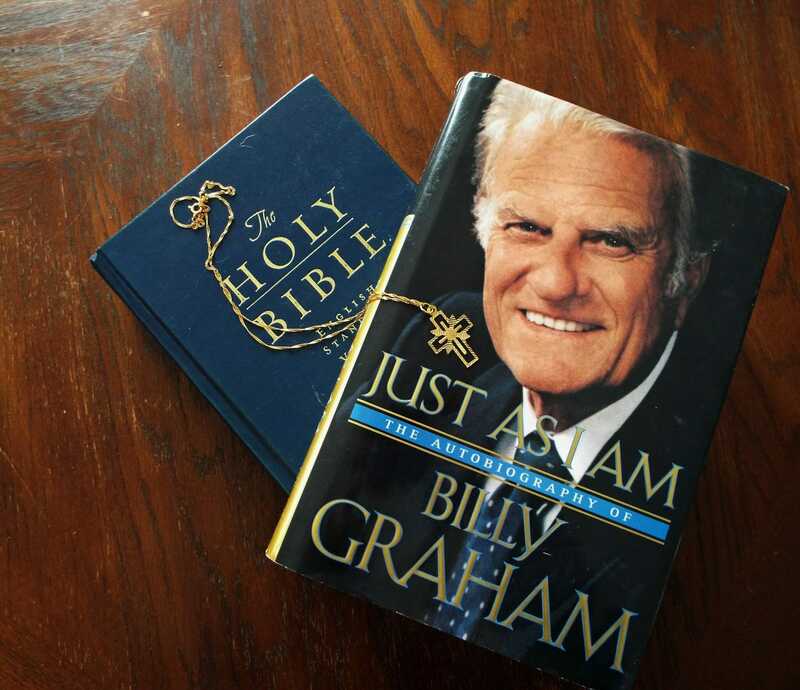 I saw only a handful of the 1000s of crusades Mr. Graham must have held over the decades. Yet his passion for the Gospel was evident in every single one. The story never got old to him. You could tell he didn’t take it for granted; it held sway over his life. That’s remarkable. You’re right. I pray that I don’t take it for granted–that I rejoice in His mercies that are new every morning, speaking the Gospel to myself daily.